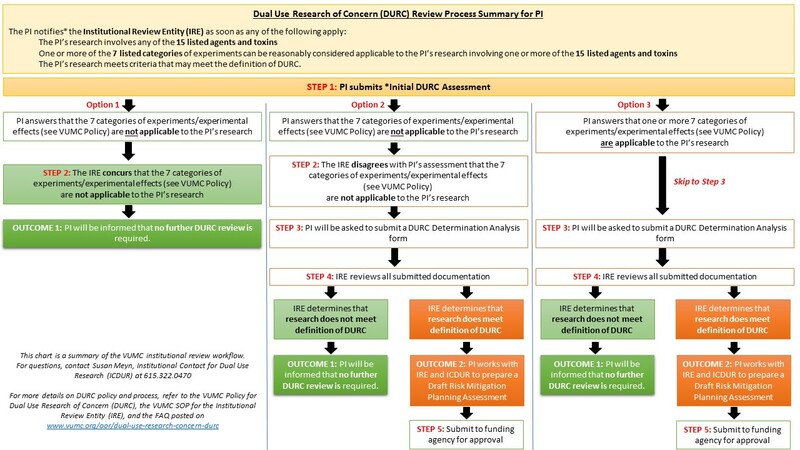 DURC is defined as life sciences research that can be reasonably anticipated to provide knowledge, information, products, or technologies that could be directly misapplied to pose a significant threat with broad potential consequences to public health and safety, agricultural crops and other plants, animals, the environment, materiel, or national security. VUMC has established an institutional policy for review and management of proposed life sciences research that may fall under the definition of DURC consistent with the United States Government Policy for Institutional Oversight of Life Sciences Dual Use Research of Concern. The VUMC policy outlines responsibilities for compliance with the Federal policy related to DURC for principal investigators (PIs), the institution, and the Institutional Review Entity (IRE). Questions? See FAQ below, or contact Susan Meyn (Institutional Contact for Dual Use Research) by phone at 615-322-0470.
Who is responsible for compliance with Federal requirements related to DURC? VUMC is responsible for establishing polices and procedures to support compliance with US Federal Government requirements related to DURC. Each principal investigator is responsible for awareness of the federal and institutional policies related to Dual Use Research of Concern (DURC), and for reporting potential DURC to the Institutional Review Entity (IRE) in compliance with these policies. What is the VUMC Institutional Review Entity (IRE)? Who is the Institutional Contact for Dual Use Research (ICDUR)? The ICDUR is designated by the institution to serve as an institutional point of contact for questions regarding compliance with and implementation of the requirements for the oversight of DURC. The ICDUR is the liaison (as necessary) between the institution and the relevant federal funding agency. At VUMC, the Director for Research Resources & Strategy, Susan Meyn (contact info below), serves as the ICDUR. I am a VUMC PI. How do I know if my research should be reviewed for potential DURC? If you are working with one or more of the listed 15 agents and toxins (see below), please submit the VUMC INITIAL DURC ASSESSMENT (IDA) form (VUnet ID required); or phone Susan Meyn for guidance. I have questions about whether my research might be defined as DURC. Can I just send questions and details by email? No. If your research does meet the definition of DURC, certain file transfer and data security requirements may apply. Please either phone Susan Meyn, or submit the Initial DURC Assessment form. I am a PI for a project, and I need to report my research for potential DURC. How to I do that? Please submit the Initial DURC Assessment form. It is recommended that you first review SOP for the IRE and the DURC Process Overview. I work with one of the 15 agents and toxins, and am sure my research does not meet the definition of DURC. Do I still need to submit an Initial DURC Assessment? Yes. If the IRE concurs with your self-assessment, there will be no further review or mitigation necessary. Refer to the SOP for the IRE and DURC Process Overview for details. What agents and toxins are subject to review for potential DURC? Who do I contact if I have any questions about DURC? Where can I learn more about DURC?